This is my interpretation of the classic art dagger. The blade is is made from ATS-34 and has a sculpted double guard made from 416 stainless. It is engraved, as well as embellished with purple amethyst gemstones. The pommel on this piece has sculpted pedals and is fully engraved. It has a purple amethyst gemstone stone in the center. 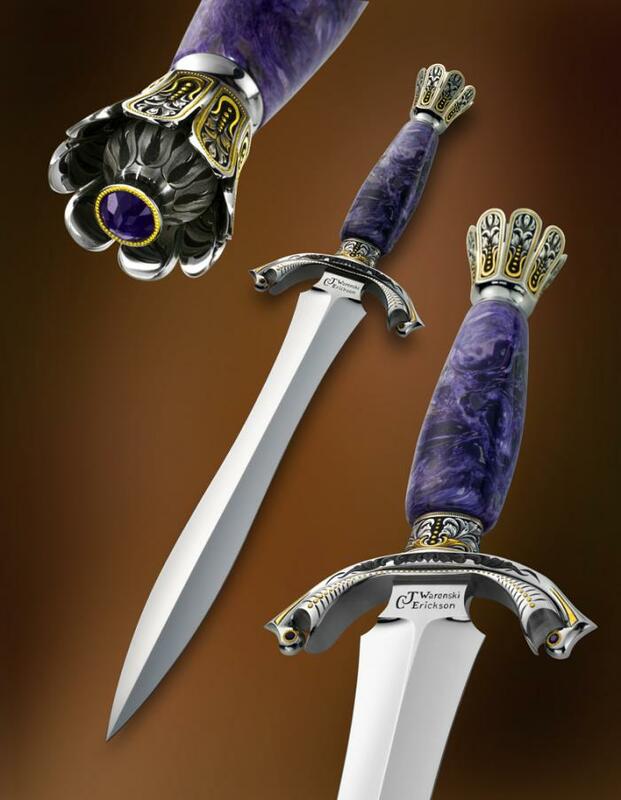 The handle is made with is a rare, and hard to find, Charoite gemstone from Russia. This work is a done as a collaboration by Curt Erickson and Julie Warenski-Erickson and is marked C. Erickson / J. Warenski on the blade .